Bat warts, lizard scales, a bit of toad’s breath -- these are just a few of the ingredients Starbucks says it’s stirring into a new, legitimately scary-looking Halloween drink this year. The spooky concoction is aptly called the Witch’s Brew Frappuccino and it sounds like something straight out of Severus Snape’s personal potions storage. Starbucks officially unleashed the new blended beverage for a limited time on Thursday at its locations across the United States, Canada, and Mexico, a spokesperson said. Unlike the coffee chain’s usual brews, the Witch’s Brew Frappuccino comes with a scary lack of caffeine (it’s not made with a coffee base), and as Snape would say, a regrettable lack of Veritaserum. It’s more like drinkable Halloween candy. To be clear, they’re not actually blending warts into the drink. As Starbucks explains in a press release, they start with a “toad’s breath” and orange crème base and layer it in the cup with green “bat warts,” which are actually just chia seeds. The brew is finished with vanilla whipped cream and a dusting of green “lizard scale” powder (it appears to be matcha powder) on top. The result is a truly bizarre beverage that looks about as appetizing as a ladle of bubbling Polyjuice Potion. 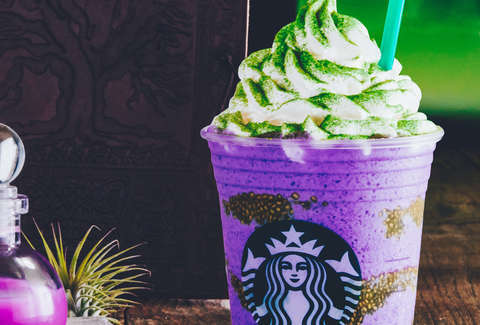 The Witch's Brew Frappuccino follows in the staggered footsteps of last year's Zombie Frappuccino, which was basically the infamous Unicorn Frappuccino back from the dead. Oh, and don't forget the Frappula Frappuccino Starbucks whipped up for Halloween in 2015 and 2016. The whole Halloween Frappuccino tradition first started in 2014 with the Franken Frappuccino, which just goes to show how far they've come with the pun-y Halloween nomenclature. Whether Professor Snape would approve of the new potion is another story, though it may help that Starbucks baristas are clearly Slytherins with their emerald green aprons and all. Tony Merevick is Senior News Editor at Thrillist and thinks they should have gone with bubble tea-like tapioca balls instead of chia seeds. Send news tips to news@thrillist.com and follow him on Twitter @tonymerevick.